The rolling landscape of Bodmin moor is a place of solitude, crisscrossed with ancient trackways and weathered granite outcrops. The area is ideally suited for walkers and hikers who love to explore away from the beaten track. 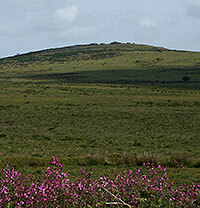 Brown Willy, the highest point in Cornwall (1375 ft - 419 m), is located to the north of the Moor; around its feet lie traces of long abandoned hut circles, sacred sites and giant tors. To the south the keen explorer can find crystal clear streams, legendary lakes, standing stones and ancient wooded copses covered in moss and lichen. If you plan to walk far on the moors then dress sensibly for the time of year; wear stout walking boots and take waterproof clothing, as the weather can quickly change. Ensure you take a map (OS Landranger Map 200 or better) and a compass (or GPS), and make sure you inform somebody where you are going and when you are likely to return. Inexperienced walkers should not travel deep into moorland unless they have a guide or are proficient in map reading. An almost circular lake, a mile in circumference, lies in the middle of Bodmin Moor. This is the lake into which Sir Bedivere is said to have flung King Arthur's sword Excalibur. Golitha Falls are located in an ancient wooded valley some 2.5 miles (4 km) north-west of Liskeard. Here the waters of the River Fowey pour from Bodmin Moor and cascade down a steep sided gorge to produce a pleasant series of small waterfalls. The Falls are popular with visitors, and a nearby car park provides access to a 3 mile (4.8 km) riverside walk. The area at southern the edge of Bodmin Moor is much populated with standing stones, barrows, quoits and other permanent reminders left to us by our prehistoric ancestors. The Cheesewring is a natural rock formation situated close to the village of Minions about 2.5 miles (4 km) north of Liskeard. 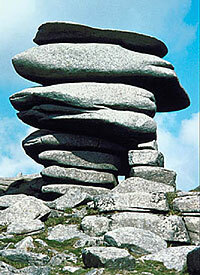 It was formed by erosion down the centuries and today stands at the edge of a quarry close by Bodmin Moor. The Cheesewring consists of massive stone discs perched precariously one on the other like a cheese pressed in a giant cheese-press. The Hurlers are also close to Minion. These consist of three large stone circles of local granite. To the west stand two outlying stones said to be the Pipers. Unlike the Merry Maidens of West Cornwall who were said to be petrified for dancing on the Sabbath, these were equally naughty lads playing the game of hurling on the Sabbath. Why the pipers were making music during the game is not clear. 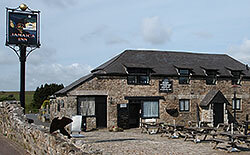 This famous old coaching inn sits beside the old A30 some 12 miles (20 km) from Bodmin. The place acquired fame from Daphne du Maurier's novel (and the subsequent film) Jamaica Inn, a frightening tale of wrecking which owes more to the author's imagination than to historical events on Bodmin Moor. A more peaceable setting can be found at Wesley's cottage in nearby Trewint where the indefatigable old Preacher used to stay when picking his way by horseback across Bodmin Moor.